Loosing your suitcase while flying is a huge bummer. A vacation-spoiling, massive-inconvenience-causing bummer. And if you’re a semi-frequent traveler, it’s not a matter of if your suitcase will ever be lost, but when. Trust me. Personally, I’ve lost my bag on three different occasions — wait, allow me to rephrase that — airlines have lost my bag on three different occasions. It’s infuriating. The first time I was flying from Los Angeles to Burbank, California and my bag ended up in Burlington, Vermont. Apparently the airpot codes can look similar and due to human error by bag ended up in the snow, not the sunshine. The second time I was flying from Los Angeles to Miami and for some unexplained reason, my bag just didn’t make it on my plane (it was delivered 2 days later to my hotel). Finally, the third time, well that was the worst time — and the memory of it stings a little more than the others because the stakes were higher and it could have been prevented so, so easily. Let me explain. I was flying from Los Angeles to Toronto to celebrate my Grandpa’s 80th birthday with my big Canadian family (my mom is Canadian). It was an important event and one I could not miss. So I left Los Angeles on a Friday morning and landed in Chicago where I had a few hour layover. Since the layover was long, I decided not to check my bag through to Toronto so I could pick it up in Chicago and have it (and the sweatshirt, book, and electronic chargers inside it), with me during my time at the airport. Now usually I’d travel with these essentials in a carry on backpack, but I packed quickly and just threw everything I’d needed into my suitcase and ran out the door to catch my flight. 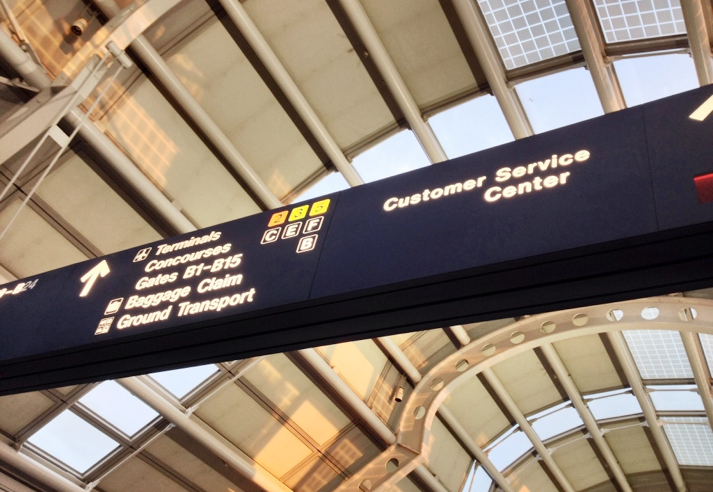 After landing in Chicago in the early afternoon, I made my way to baggage claim. At this point I was thinking that the rest of my weekend was on auto pilot — I’d grab my bag, hang out for a few hours, catch my early evening flight to Toronto, have a great dinner with my family, get a good night sleep, and wake up refreshed for my Grandpa’s party on Saturday. I waited at the baggage carousel for my bag until there were no bags left and I was the only person left standing there. My bag was gone. I left my passport in my suitcase. And without a passport, there was no way I was getting into Canada. That’s when I started to panic. I went to the lost baggage office and filed a report. I gave them the receipt for my checked bag so they could track the number and see where it was. As if it couldn’t get any worse, there was no record of the bag being scanned in the system anywhere. My suitcase was neither here, nor there, nor anywhere. As the airline baggage claim employee made calls, called in supervisors and literally went back into the mysteryland that exists beyond the baggage claim walls to search for my bag herself, hours start to pass. I missed my connecting flight to Toronto. Another 2 hours went by and I missed the next flight to Toronto. Then there was just one more flight left departing to Toronto that day and if I wasn’t on it, I wouldn’t make it to my Grandpa’s birthday party the next day. Desperate, I started walking around baggage claim and noticed there were strange metal boxes next to each carousel. They were several feet long, a few feet high and had small holes in the sides big enough to look through and see in. Inside were suitcases. They were luggage lockers for unclaimed bags. At the third locker I peeked into, the one at the carousel next to the one my bag was supposed to come out on, and just 20 feet from the baggage office where I’d been sitting for the past several hours, was my bag. Yes, my suitcase was 20 feet away from me the entire time. Turns out my suitcase somehow avoided being scanned or the bar code on the tag was defective and the bag came out on a carousel for a different flight. When it wasn’t picked up from that carousel, it was just stuffed in a locker. So I ran back to the office, got an employee to open the locker, grabbed my bag, ran through the terminal and just made it on the very last flight of the night which got me into Toronto after midnight. So much for dinner with my family and a good night sleep. Yes, it was terrible and insanely stressful. But like I said at the beginning of the story — what makes it worse was how easily all of this could have been prevented. Recently, I was sent a Tile, a little gadget that allows you to locate a missing item. Tile is simple — all you have to do is place a Tile with an item that’s prone to being lost (it can be hooked to your car keys, stuck to your laptop or a remote control, or placed inside a wallet, and yes, a suitcase), then download the free iOS or Android app to pair with your Tile. As soon as I got my Tile, I immediately thought about the time my suitcase was lost on my way to Toronto and how finding my bag could have taken 30 seconds, not 7 hours, had there been a Tile inside. All I would have had to do was place my Tile in my suitcase before leaving the house, then once I realized it was lost, opened the app to see on a map the last place my Tile was seen, or to see if it was nearby. I definitely learned a lesson from that experience and when I fly to New York in a few days, you can bet my Tile will be in my suitcase. 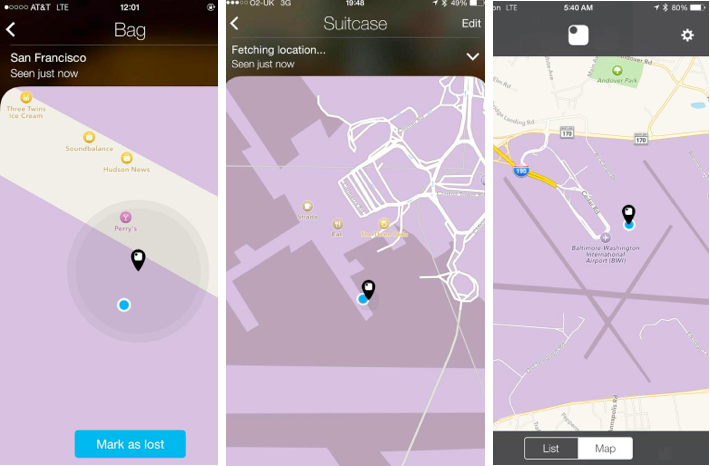 Here are a few screenshots from real Tile uses who’ve used their Tile to keep track of their suitcases at airports. For example, you can be sitting on your plane at the gate, open your Tile app, and see your bag with Tile inside (the black map pin) beneath you (meaning it’s in the cargo hold). 1) Hook Tile To Your Rental Car Keys — While Tile can be used to keep track of your keys everyday while at home, when you’re traveling you often don’t designate a spot to keep your rental car keys. They could end up anywhere while traveling — in a bag, in the bathroom, under a pillow or in between the sofa cushions. To locate them, simply set your Tile to ring and follow the sound until you find them. 2) Place It In Your Wallet — Just like rental car keys, while you’re traveling, you probably won’t have a set place you put your wallet when it’s not in your pocket and it can easily become lost. Not if there’s a Tile inside. 3) Place Tile In Your Car At The Airport - How often have you arrived back from a trip and not been able to remember where you parked in the parking garage? It’s happened to me more times like I’d like to admit. 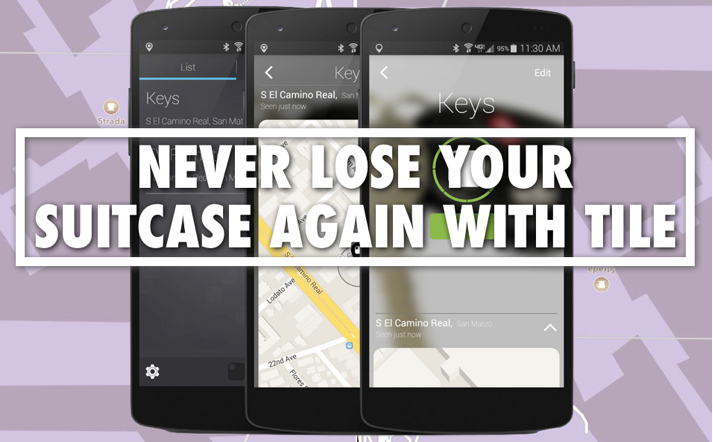 To make sure it never happens again, just place a Tile in your car and when you get back to the garage, open the app to see the location of your car a map (the Tile app keeps track of the last place it it connected with your Tile, marking it’s location). You can buy a single Tile for $25, a pack of 4 Tiles for $70, 8 Tiles for $130, or 12 Tiles for $180. Photo Credit: Airport photo by Christopher Tran.